Published Jul 14, 2015 by Peachpit Press. This critically-acclaimed interactive training program from Adobe Press offers exceptional quality high-definition video to teach the fundamentals of Adobe Photoshop Lightroom CC (2015 release) / Lightroom 6. Including more than 12 hours of video tutorials, the course comes complete with lesson files, assessment quizzes, and review materials. 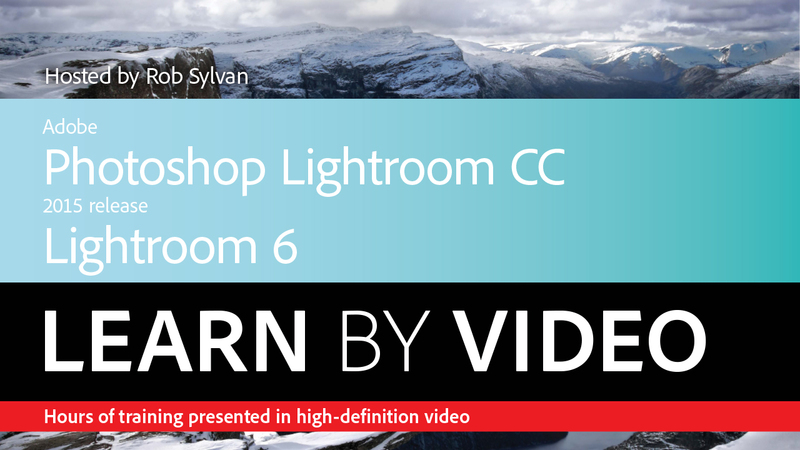 Experienced instructor Rob Sylvan presents a comprehensive introduction to Photoshop Lightroom, including best practices as well as fundamental photography and image editing concepts. Beginning with an overview of the Lightroom interface and working with the Library Module, Rob goes on to cover Lightroom’s powerful editing tools, tools for local adjustments, the Map Module, exporting, printing, and creating slideshows, web galleries, and books. At the conclusion, Rob dives into project explorations and explains how to use Smart Previews, the new HDR feature, the new Merge to Panorama feature, and the improved Lightroom Mobile. The video is wrapped in a unique interface that allows you to jump to any topic and also bookmark individual sections for later review. The unique “Watch and Work” mode shrinks the video into a small window to allow you to work alongside in Adobe Photoshop Lightroom as you view the video. Project files used in the lessons are included on the disc so you can practice what you’ve learned. At the end of every lesson, you can test your knowledge by taking interactive quizzes.